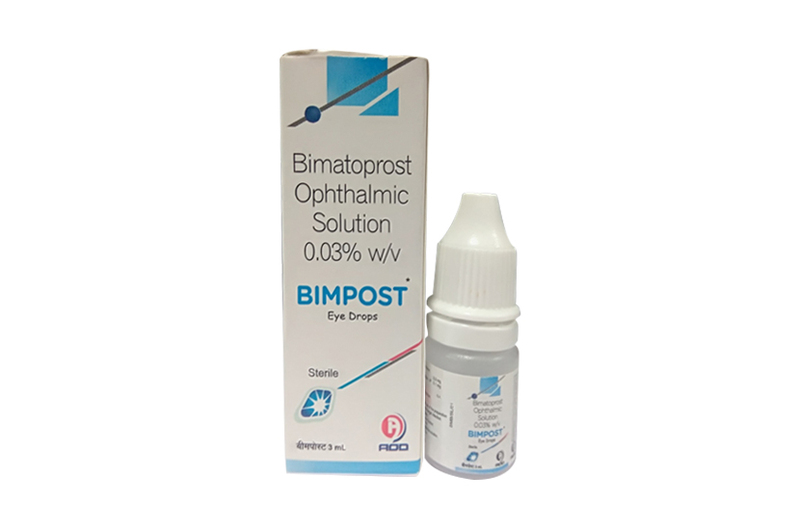 Bimpost Eye Drops (Bimatoprost Eye Drops 0.03%) is a synthetic prostamide analog with ocular hypotensive activity and is used to treat certain diseases of the eye like open-angle glaucoma and ocular (eye) hypertension which occurs in many people as they grow older. Glaucoma is caused by high pressure in your eye and can lead to pain from pressure in your eye and then can eventually harm your vision. This medicine can help you keep your sight by reducing the pressure in your eye and stopping eye pain. Bimpost Eye Drops is solution is also used to treat eyelash hypotrichosis (not enough eyelashes) by increasing their growth and making the eyelashes longer, thicker, and darker. Primary packing - 3 ml clear poly bottles, white caps &nozzles. 3 ml of solution in White poly bottles with white caps & nozzles in properly sealed. Bimatoprost, a prostaglandin analog, is a synthetic structural analog of prostaglandin with ocular hypotensive activity. It selectively mimics the effects of naturally occurring substances, prostamides. Bimatoprost is believed to lower intraocular pressure (IOP) in humans by increasing outflow of aqueous humor through both the trabecular meshwork and uveoscleral routes. Elevated IOP presents a major risk factor for glaucomatous field loss. The higher the level of IOP, the greater the likelihood of optic nerve damage and visual field loss. Absorption: After one drop of Bimpost Eye Drops was administered once daily to both eyes of 15 healthy subjects for two weeks, blood concentrations peaked within 10 minutes after dosing and were below the lower limit of detection (0.025 ng/mL) in most subjects within 1.5 hours after dosing. Mean Cmax and AUC0-24hr values were similar on days 7 and 14 at approximately 0.08 ng/mL and 0.09 nghr/mL, respectively, indicating that steady state was reached during the first week of ocular dosing. There was no significant systemic drug accumulation over time. Distribution: Bimatoprost is moderately distributed into body tissues with a steady-state volume of distribution of 0.67 L/kg. In human blood, bimatoprost resides mainly in the plasma. Approximately 12% of bimatoprost remains unbound in human plasma. Metabolism: Bimatoprost is the major circulating species in the blood once it reaches the systemic circulation following ocular dosing. Bimatoprost then undergoes oxidation, Ndeethylation and glucuronidation to form a diverse variety of metabolites. Elimination: Following an intravenous dose of radiolabeled bimatoprost (3.12 mcg/kg) to six healthy subjects, the maximum blood concentration of unchanged drug was 12.2 ng/mL and decreased rapidly with an elimination half-life of approximately 45 minutes. The total blood clearance of bimatoprost was 1.5 L/hr/kg. Up to 67% of the administered dose was excreted in the urine while 25% of the dose was recovered in the feces. Bimpost Eye Drops (Bimatoprost Eye Drops 0.03%) is indicated for the reduction of elevated intraocular pressure in patients with open angle glaucoma or ocular hypertension. Pigmentation Bimatoprost ophthalmic solution has been reported to cause changes to pigmented tissues. The most frequently reported changes have been increased pigmentation of the iris, periorbital tissue (eyelid) and eyelashes. Pigmentation is expected to increase as long as bimatoprost is administered. The pigmentation change is due to increased melanin content in the melanocytes rather than to an increase in the number of melanocytes. After discontinuation of bimatoprost, pigmentation of the iris is likely to be permanent, while pigmentation of the periorbital tissue and eyelash changes have been reported to be reversible in some patients. Patients who receive treatment should be informed of the possibility of increased pigmentation. The long term effects of increased pigmentation are not known. Iris color change may not be noticeable for several months to years. Typically, the brown pigmentation around the pupil spreads concentrically towards the periphery of the iris and the entire iris or parts of the iris become more brownish. Neither nevi nor freckles of the iris appear to be affected by treatment. While treatment with Bimpost Eye Drops (Bimatoprost Eye Drops 0.03%) can be continued in patients who develop noticeably increased iris pigmentation, these patients should be examined regularly [see Patient Counseling Information. The recommended dosage is one drop in the affected eye(s) once daily in the evening Bimpost Eye Drops (Bimatoprost Eye Drops 0.03%) should not be administered more than once daily since it has been shown that more frequent administration of prostaglandin analogs may decrease the intraocular pressure lowering effect. Reduction of the intraocular pressure starts approximately 4 hours after the first administration with maximum effect reached within approximately 8 to 12 hours. Bimpost Eye Drops (Bimatoprost Eye Drops 0.03%) may be used concomitantly with other topical ophthalmic drug products to lower intraocular pressure. If more than one topical ophthalmic drug is being used, the drugs should be administered at least five (5) minutes apart. Bimpost Eye Drops (Bimatoprost Eye Drops 0.03%) is supplied in one clear polethylene Bottle packed with printed labelled & cartons and such 25 cartons packed in a shrink sleeves & corrugated box.